Risking death by sea or on foot, nearly 700,000 have fled the destruction of their homes and persecution in the northern Rakhine province of Myanmar (Burma) for neighbouring Bangladesh since August 2017. The United Nations described the military offensive in Rakhine, which provoked the exodus, as a "textbook example of ethnic cleansing". Myanmar's military says it is fighting Rohingya militants and denies targeting civilians. 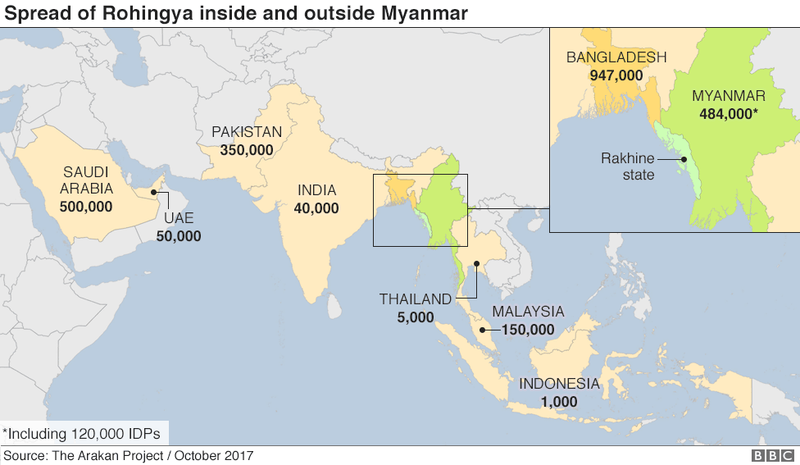 The Rohingya, who numbered around one million in Myanmar at the start of 2017, are one of the many ethnic minorities in the country. 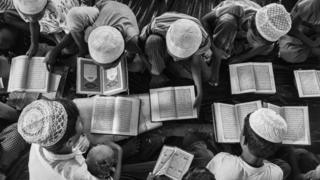 Rohingya Muslims represent the largest percentage of Muslims in Myanmar, with the majority living in Rakhine state. They have their own language and culture and say they are descendants of Arab traders and other groups who have been in the region for generations. Since the 1970s, Rohingya have migrated across the region in significant numbers. Estimates of their numbers are often much higher than official figures. In the last few years, before the latest crisis, thousands of Rohingya were making perilous journeys out of Myanmar to escape communal violence or alleged abuses by the security forces. The latest exodus began on 25 August 2017 after Rohingya Arsa militants launched deadly attacks on more than 30 police posts. Rohingyas arriving in an area known as Cox's Bazaar - a district in Bangladesh - say they fled after troops, backed by local Buddhist mobs, responded by burning their villages and attacking and killing civilians. At least 6,700 Rohingya, including at least 730 children under the age of five, were killed in the month after the violence broke out, according to Medecins Sans Frontieres (MSF). Amnesty International says the Myanmar military also raped and abused Rohingya women and girls. The government, which puts the number of dead at 400, claims that "clearance operations" against the militants ended on 5 September, but BBC correspondents have seen evidence that they continued after that date. At least 288 villages were partially or totally destroyed by fire in northern Rakhine state after August 2017, according to analysis of satellite imagery by Human Rights Watch. 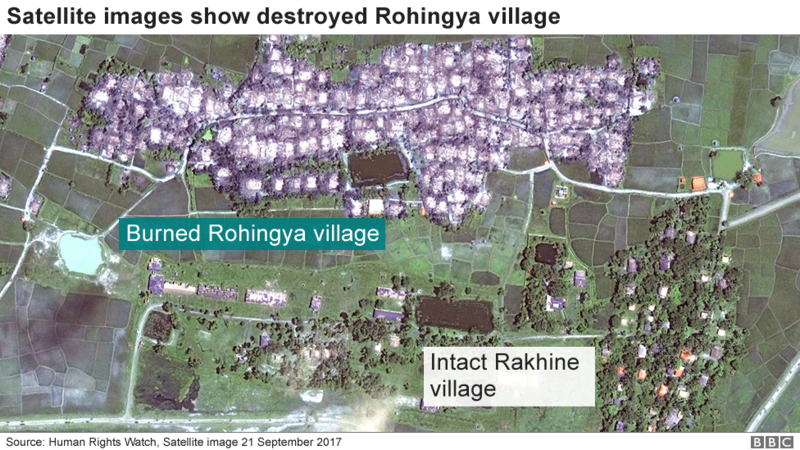 The imagery shows many areas where Rohingya villages were reduced to smouldering rubble, while nearby ethnic Rakhine villages were left intact. Human Rights Watch say most damage occurred in Maungdaw Township, between 25 August and 25 September 2017 - with many villages destroyed after 5 September, when Myanmar's de facto leader, Aung San Suu Kyi, said security force operations had ended. What is the scale of the crisis? The UN says the Rohingya's situation is the "world's fastest growing refugee crisis". Before August, there were already around 307,500 Rohingya refugees living in camps, makeshift settlements and with host communities, according to the UNHCR. A further 687,000 are estimated to have arrived since August 2017. Most Rohingya refugees reaching Bangladesh - men, women and children with barely any belongings - have sought shelter in these areas, setting up camp wherever possible in the difficult terrain and with little access to aid, safe drinking water, food, shelter or healthcare. The largest refugee camp is Kutupalong but limited space means spontaneous settlements have sprung up in the surrounding countryside and nearby Balukhali as refugees keep arriving. 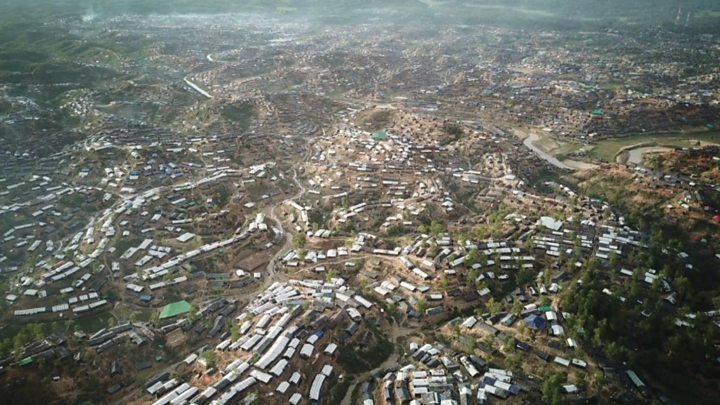 While numbers in the Kutupalong refugee camp have reduced from a high of 22,241 to 13,900, the number living in makeshift or spontaneous settlements outside the camp has climbed from 99,495 to more than 604,000. Most other refugee sites have also continued to expanded - as of mid-April 2018, there were 781,000 refugees living in nine camps and settlements. There are also around 117, 000 people staying outside the camps in host communities. What is being done by the international community? The need for aid is overwhelming. With the monsoon season approaching, work has begun to re-locate some refugees from the camps most at risk of flooding or landslides and in other sites, work has been taking place to improve drainage channels and strengthen shelters. About 70% of the one million refugees are now receiving food aid, according to the Inter Sector Coordination Group report from mid-April 2018. Large-scale vaccination programmes have been launched to try to minimise the risk of disease. By mid-January 2018, 315,000 children under 15 years of age had received a five-in-one vaccination, including cover for diptheria, tetanus and whooping cough. The US urged Myanmar's troops to "respect the rule of law, stop the violence and end the displacement of civilians from all communities"
China says the international community "should support the efforts of Myanmar in safeguarding the stability of its national development"